Many of our daily decisions are based on some analysis of effect size. We sign up for courses that we believe will enhance our career prospects. We cut back on carbohydrates to lose weight. We stop at red lights to reduce the risk of accidents. We buy stock we believe will appreciate in value. We take an umbrella if we perceive a high chance of rain. 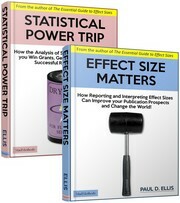 The interpretation of effect sizes is how we make sense of the world. In this sense researchers are no different from anybody else. Where researchers do differ is in the care taken to generate accurate effect size estimates. But while we may spend a lot of our time looking for ways to reduce sampling and measurement error, among other things, ultimately our goal is a better understanding of real world effects. And this is why it is essential that we interpret not only the statistical significance of our results but their real world or substantive significance as well. For more on how to do this, check out the e-book Effect Size Matters. Your estimate of the effect size constitutes your study’s evidence. A p value might tell you the direction of an effect, but only the estimate will tell you how big it is. Reporting the effect size facilitates the interpretation of the substantive significance of a result. Without an estimate of the effect size, no meaningful interpretation can take place. Effect sizes can be used to quantitatively compare the results of studies done in different settings.